The Tenth Muse explores writings on the cinema in the first decades of the twentieth century. 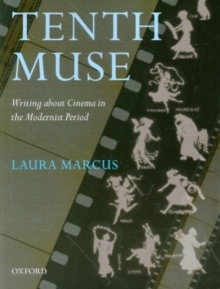 Laura Marcus examines the impact of cinema on early twentieth-century literary and, more broadly, aesthetic and cultural consciousness, by bringing together the study of the terms and strategies of early writings about film with literary engagement with cinema in the same period. She gives a new understanding of the ways in which early writers about film -reviewers, critics, theorists - developed aesthetic categories to define and accommodate what was called 'the seventh art' or 'the tenth muse' and found discursive strategies adequate to the representation of the new art and technology of cinema, with its unprecedented powers of movement. In examining the writings of early film critics and commentators in tandem with those of more specifically literary figures, including H.G.Wells and Virginia Woolf, and in bringing literary texts into this field, Laura Marcus provides a new account of relationships between cinema and literature. Intertwining two major strands of research - the exploration of early film criticism and theory and cinema's presence in literary texts - The Tenth Muse shows how issues central to an understanding ofcinema (including questions of time, repetition, movement, vision, sound and silence) are threaded through both kinds of writing, and the ways in which discursive and fictional writings overlapped. The movement that defined cinema was also perceived as a more fragile and unstable ephemerality that inhered at every level, from the fleeting nature of the projected images to the vagaries of cinematic exhibition. It was the anxiety over the mutability of the medium and its exhibition which, from the 1920s onwards, led to the establishment of such institutional spaces for cinema as the London-based Film Society, the new film journals, and, in the 1930s, the first film archives. The Tenth Museexplores the continuities between these sites of cinematic culture and the conceptual, literary and philosophical understandings of the filmic medium.